One of the main purposes of a content management system is to allow non–technical users to add material to a website. What the non–technical users actually add material to is a Textpattern article. The Textpattern article is inserted into the Textpattern page by a Textpattern article tag. A newspaper article normally consists of a headline, some text, and maybe an image. A Textpattern article, on the other hand, can consist of all of those elements, or more, or fewer. The system allows you to use different elements of an article in different situations, and in unlimited combinations. This versatility is one of Textpattern’s most useful features. An image field. To specify that a particular image should appear with a particular article, upload an image, note its ID number, and fill in the ID number in the image field. The only field that must be filled in when creating an article is the title, which is required for reference purposes. Everything else is optional. In practice, an article’s title will normally be used somewhere in the website, but it does not need to be. In Textpattern’s default set–up as a blog, the Body field was intended to contain the main substance of the article, while the Excerpt field contained, as you might have guessed, an excerpt from the article. Because the Body field is larger than the Excerpt field, it is a more practical choice for the bulk of the article. But the functions of both fields are essentially equivalent, and they may be used interchangeably. 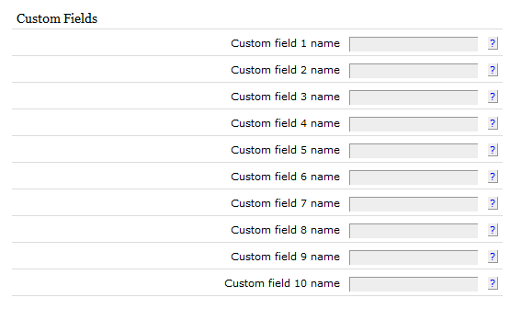 When creating a Textpattern article, you may fill in any or all of the available fields. Any part of any Textpattern article may be used any number of times, anywhere in the website. Each field in a Textpattern article is an item in the Textpattern database, and may be used by itself or in combination with any number of other items. This tag means: display all or part of an article here. Both types of article tag perform exactly the same function. The container tag, however, is less useful in practice, so we will ignore it for now and deal with it later. Which parts of that article to display. To specify which parts of a Textpattern article are to appear in a particular place in a Textpattern page, we need to use a Textpattern form. You had probably worked this out. It is what we did earlier when placing the website’s footer in a Textpattern form. The tool for this purpose is not a miscellaneous form, but an article form. One important difference between the two types of form is the need to accommodate the range of extra options that a Textpattern article provides. The article form allows and requires us to specify the parts of the article that are to be used in a particular instance. and the specific article that is to be displayed. There are several ways to specify which article is to be displayed. For now, we will look at the most straightforward way, which is to specify the ID number that is automatically assigned to the article when it is created. It can be found by clicking the Articles tab, which reveals a list of the articles currently on the database. Both of these tags mean: display here the parts of article number 25 that are specified in the form called ‘whatever’. The final part of the process is to specify which parts of the article are to be displayed. To do this, we first need to create an appropriate form. Go to Presentation, then Forms. Give the form a name. From the drop–down Type list, select article. There are no restrictions on which parts or combination of parts of a Textpattern article you can use in a Textpattern article form. You get the general idea. The Textbook website contains a full list of Textpattern tags and their properties. Other tags, not part of the default Textpattern installation, are generated by plug–ins, and work in the same way. 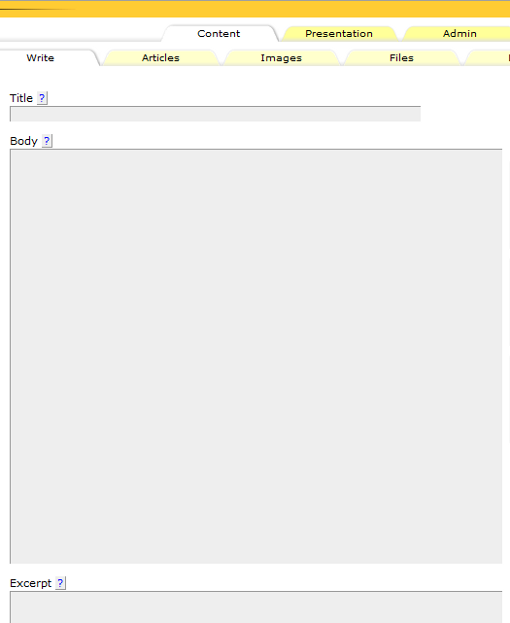 Placing a Textpattern title tag in a Textpattern page simply instructs Textpattern to insert the contents of the title field into the page. In the above examples, the title tag was used as a heading, but it does not need to be. You can place it within any HTML tag and use it anywhere on a page. You will have noticed that in the above examples, the Textpattern title tag is enclosed within HTML tags while the body and excerpt tags are not. If you like, you may enclose the body and excerpt tags within HTML tags, but in practice you rarely will, because these fields will invariably contain HTML tags, either coded by hand or formatted using Textile. You can include all sorts of other things within a Textpattern article form. As with a Textpattern miscellaneous form, you can include as much text and HTML as you want. You can even include a miscellaneous form within an article form.The only requirement is that if a form includes any part of a Textpattern article, it has to be classified as an article form. Otherwise it won’t work. There is, however, a method that doesn’t require the use of a Textpattern form, although it is rarely used. This type of article tag can be used directly in a Textpattern page without having to use a form. Like inline CSS, you may find it useful in single instances. Most of the time, however, you will find that using a form, like using a CSS stylesheet, is more efficient. As well as placing an article inside a page by using a form, it’s also necessary to assign each article to a section. Think of a section as a directory or folder in which you store documents. In this case, the documents are Textpattern articles. A section is the main structural unit of a Textpattern website. By using articles and sections together, we can create complex database websites. Continue with the next article: Textpattern Articles and Sections.